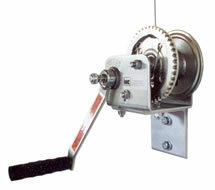 The Brake Winch Hoist which does NOT have the pulleys. This hoist usually takes two people to remove and install the top, depending on the location of the winch. One person turns the crank and the other guides the top into position.